September 11 is no ordinary day. It is a time to remember the 2,977 lives lost and the countless people who have since risked and sacrificed for our freedom. The horrific attacks of 9/11 threatened our freedom and country. If we do not memorialize the day or the innocent people who died, the day will become sanitized. To make sure that this doesn’t happen, there are several activities you can do at your high school. Whether it’s setting up a flag memorial, holding signs or organizing a moment of silence, 9/11 can be recognized school-wide. The Sam Houston TARS of Louisiana hold silent signs for drivers to read on their way to school. Each TAR holds a sign with one word that together reads, “Never – Forget – 9/11 – God – Bless – America.” These are effective, frugal, and peaceful. You can also create a poster to be displayed at school in an area that has lots of foot traffic. Work with your school and JROTC to make sure the American flags on campus are at half mast, as well as ask permission from school authorities to set up a memorial. If the memorial is at the foot of an American flag, then it has a greater chance of being protected than if it were a stand-alone display. 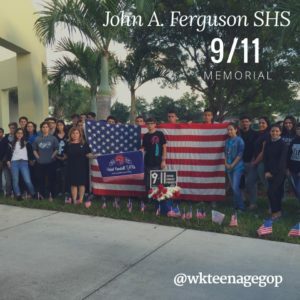 You can also create a memorial with flags to represent those who died, like the Ferguson HS TARS of Florida featured in the picture. Set up a fundraiser to buy these flags. It’s not necessary to place all 2,977 flags; even 40-100 will be an impressive way to honor those who died. Finally, ask your school administration if there will be a moment of silence in the morning. If not, ask that one be held at 9:11 AM. 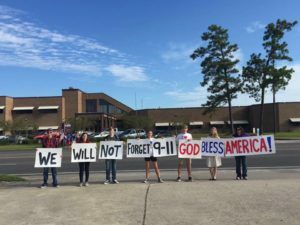 There are traditionally six moments of silence to mark the events of September 11, but this is a general time that the school may be more apt to follow. If a formal moment of silence will not be held school-wide, ask individual teachers if they will stop to recognize the time. Work with several community service organizations at your school, such as Beta Club, National Honor Society and Christian clubs. If your school administration sees that several clubs are interested in getting involved, they may not decline the memorials out of bias. Plus, by working with several clubs, more students will hear about the plan and get involved. Make sure that your school and your TAR Club are honoring September 11. The day cannot be dismissed as a normal day. America’s history was impacted on this day. We, as American Patriots, cannot let it simply pass by. Tag us with your pictures! Share with us on Twitter @National_TARS and National Teen Age Republicans on Facebook!